This week we get to look at a pretty interesting and relevant topic. This week, we tackle the question: Why are we here? Actually, Jesus tells us why in our passage. I believe we will see our lives in a whole new way as we discover what Jesus calls us to do and how to do it. 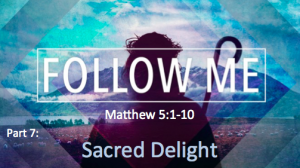 To prepare, read Matthew 5:13-16. You’ve probably read these words before, but they are tremendously significant. I also want to remind you to bring in your shoe boxes for Operation Christmas Child (along with $9 for the shipping if you are able). This is a great opportunity to be salt and light! When Jesus begins the Sermon on the Mount, he starts by describing a Godly and blessed lifestyle. We call these the Beatitudes and they represent a radical way to live. Jesus never planned to carry out his mission alone. In this message we see had radical it was to pick the disciples he did. Jesus never planned to carry out his mission on earth alone. When you think about that– God partners with man to achieve His goal– it is somewhat mind blowing. Why? What does a group of broken sinners bring to the table? How come he invites those he had to come save to work alongside him? Radical, huh? Different then any other religion, that’s for sure. We see this play out when Jesus begins to pick his formal “disciples”– the men who would travel and live with him for three years and then carry on the ministry after he ascends to heaven. To prepare, read Matthew 4:18-25. In order to follow Jesus, we must be willing to participate in radical humility. This is not an easy thing to do. Seems simple enough, right? So why do we have such a hard time doing it? I think we struggle in two related areas: pride and humility. Jesus calls us to be people of radical humility. This week we will explore that idea a bit– because we live in a culture that desperately need us to live this out. To prepare, read Matthew 5:43-47, Matthew 7:1-4, and Philippians 2:1-4.